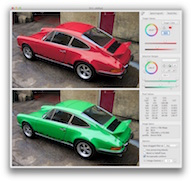 HueShifter is an amazing new application for doing color transposition or "color shifting" in images. Unlike other graphics applications, HueShifter works in perceptually uniform colorspace so you can make changes that are virtually imperceptible, all while working with color dimensions that you're familiar with - hue, saturation and lightness. Modern image editors can do a lot of things, but some things take a lot of time to get good results. So the question becomes, how much time do you have to spend? Try selecting and changing colors. 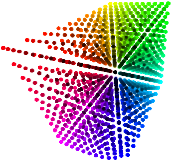 Because colors blend together, most programs that work in RGB color space will produce mediocre results with anything but the simplest scenarios. To get good results, you have to make selection masks and really work hard to clean up edges and blends. HueShifter makes color changing easy. HueShifter allows you to select colors in dimensions that make sense - hue, saturation and lightness. Hue is the color. Think red, yellow, green, blue, etc. Select a hue range and feather your color selection into neighboring colors for smooth transitions. Saturation is how colorful it is. Think gray, then think colorful. Narrow your selection to just a subtle color cast, target a specific vivid color, or select everything in between. Lightness is how bright the color is. Think black, then think white. Select only shadows, select only highlights, or select everything in between. 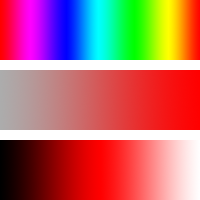 You can change bright red to blue, for example, without colors becoming overly saturated or damaging the overall tonality of the image. And your selections can feather and blend seamlessly into neighboring pixels without any visible fringing. HueShifter is a standalone Mac app that works right alongside Adobe Photoshop and many other image editing applications. HueShifter supports Drag & Drop and Copy & Paste, so it's easy to get image data in and out. 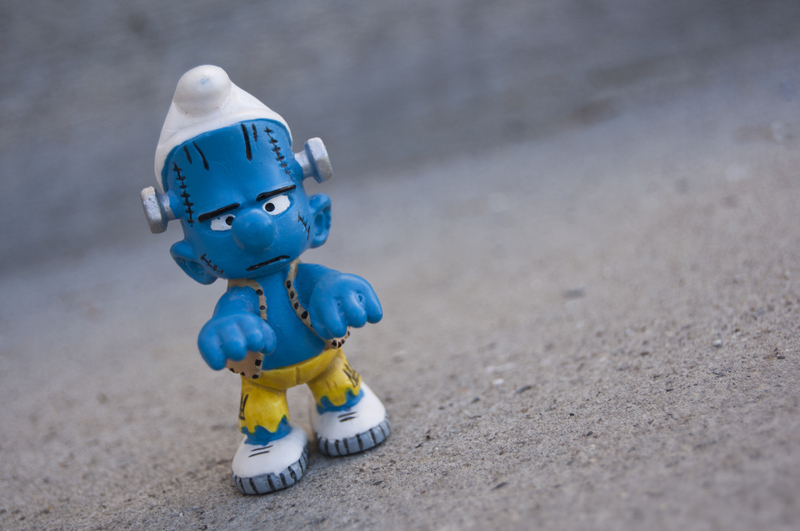 Drag or paste images into HueShifter, then drag or copy the results back to another app. Or use HueShifter's selections to make a grayscale mask for use as a layer mask in another app. 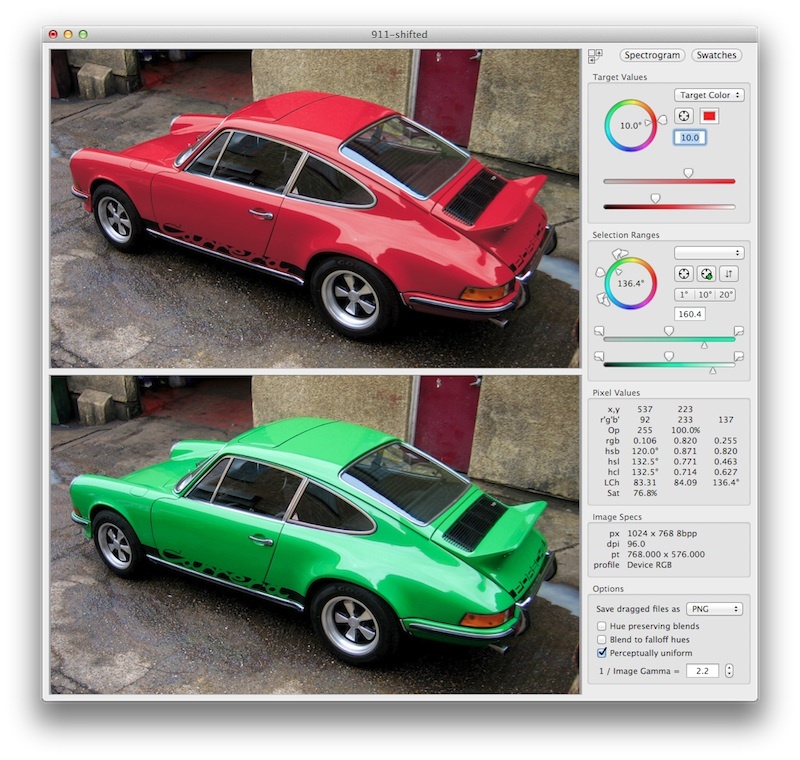 HueShifter supports images with alpha and it maintains embedded color profiles so your colors remain accurate. HueShifter works in real-time as you drag its sliders. It's multi-threaded so it makes use of that fancy multi-core processor you have, plus it's efficient and doesn't make you watch progress bars or waste your laptop's battery. Like a plugin for your favorite image editor, HueShifter is specialized tool for helping you get your job done better and more efficiently. Check out the FAQs (frequently asked questions) and you might find an answer. If not, feel free to email us and ask. Download below, then purchase from within the app for $29.95. When you're ready to purchase, simply choose "License" from HueShifter's menu and click the "Purchase" button to checkout. After checkout, HueShifter will auto-activate and you'll receive a receipt with your serial number which is good on up to five computers. Photoshop and the Photoshop icon are registered trademarks of Adobe Systems Incorporated. 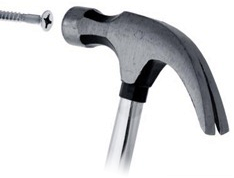 HueShifter is a trademark of bergdesign inc.